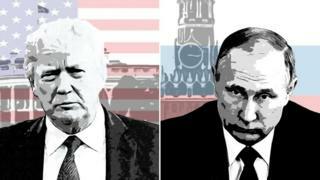 Russia-Trump: Who's who in the drama to end all dramas? It was more gripping than any box set we could get our hands on. Over two years, the investigations into Russian interference in the US election, and whether the Trump campaign colluded with the Kremlin, delivered daily developments and drama worthy of anything seen in House of Cards. In the end, 35 people and three companies were charged by Robert Mueller, the special counsel who investigated Russian interference in the 2016 election. Here's our guide to the main characters in the four seasons of the only political drama that mattered. This was the season in which Donald Trump, the reality TV star, took centre stage in his own political drama by launching a presidential campaign. He was supported by his family and got the attention of the Russians. The season ended with a cliffhanger - could Trump the outsider actually win?! It's been a while since all of this happened, so let's remind you of the key players in this season. Who was he? Donald Trump, the billionaire candidate (who by Season Three is the 45th president of the United States). If you really need a refresher, here's his life story. Key plot line As Donald Trump was busy traversing the country canvassing for votes in Season One, Russia hacked into the emails of his Democratic rivals, investigators later said. The question is why? Was the Kremlin trying to alter the outcome of the election, and what did Trump and his campaign know? Skip forward to the end of Season Four and Mr Trump stood triumphant before reporters in a Florida airport, celebrating what he called "a complete and total exoneration". But in between, there was no shortage of drama or tension. Who was he? He was Trump's campaign chairman before being forced to quit over his ties to Russian oligarchs and Ukraine. Key plot line He was one of the biggest dominoes to fall. When he ended up being arrested, it was a big season-ending shocker. Manafort hung around a bit in Season One, but then disappeared from view for a while. He quit the campaign after being accused of having links to pro-Russian groups in Ukraine. He also sat in on a crucial meeting with a Russian lawyer who may have been trying to feed the Trump team classified information (more on that later). After an FBI raid on his home in Season Three, Manafort was found guilty on eight charges of tax fraud, bank fraud, and failing to disclose foreign banks accounts and is sentenced to 47 months in prison. In Season Four, he agreed to co-operate with a special counsel inquiry in exchange for a reduced prison term. But then, in a twist - prosecutors claimed he breached his plea bargain by repeatedly lying to the FBI. Who was he? The president's eldest child, who it emerged met some questionable Russians. Key plot line Donald Trump Jr's role in this unfolding saga all came down to a meeting he had with a Russian lawyer, which was set up by a music publicist (the full details of which come out in Season Three). If it sounds random, then in many ways it is. The publicist, Rob Goldstone, offered Trump Jr a meeting with lawyer Natalia Veselnitskaya, promising him dirt on Hillary Clinton. This meeting was the key to much of our plot line because it raised several key questions. Did this amount to the campaign colluding with a foreign government? Why did he agree to the meeting? What happened at the meeting was the scene investigators played over and over again as they tried to work out if there was any impropriety. In the end, no collusion charges were brought. Donald Trump confounded his critics by winning the presidency. But the transition was as gripping as the season before it as Trump picked his cabinet, introducing key characters to the mix. The season ended with Trump taking the oath of office on a cold January morning - but there were more twists to come. Who was he? The granite-faced former general who later became the shortest-serving member of Donald Trump's cabinet. He resigned after not being honest about his contact with a Russian official - and was later charged with making false statements to the FBI. Key plot line Flynn was appointed national security adviser just days after the election, against the advice of then-President Obama, who warned Trump not to hire him. Flynn's starring role came in December 2016, just before Trump was sworn in, when he spoke to the Russian ambassador, Sergei Kislyak. The Washington Post and New York Times said the men discussed Russian sanctions, and that Flynn later lied to the Vice President Mike Pence about the conversation (Mr Kislyak says the men discussed only "simple things"). The substance of those talks eventually led to Flynn being prosecuted as part of the investigation led by special counsel Robert Mueller. At the end of Season Three, in December 2017, Flynn pleaded guilty to making "false, fictitious and fraudulent statements" to the FBI about what he and Kislyak discussed. With that, the investigation reached Trump's inner circle. Read more: Out after 23 days - who is Michael Flynn? Who was he? Many roads in this drama led back to Sergei Kislyak, the jolly and charismatic figure, who up until July 2017 was the Russian ambassador to Washington. Key plot line Kislyak's role in this drama remained unclear up to the end - but many of the players in this drama had meetings with him, and that put them in awkward spots. The key questions for investigators were: why were they drawn to him, and what was said? The Russian ambassador spoke to both Flynn and Attorney-General Jeff Sessions - meetings which both Trump officials didn't initially acknowledge took place. Anything else we should know? Well, Russia fiercely fought back against claims on CNN that Kislyak was a "top spy and recruiter of spies". Who was he? Jefferson Beauregard Sessions III hovered in the background during Season One, when he was an Alabama senator and a trusted Trump adviser, but we really got to know him during Season Two, when he became Trump's nominee for attorney general, a job he kept for almost two years. Key plot line Sessions was one of several Trump aides to meet Russian ambassador Sergei Kislyak, and question marks emerged over the nature of those meetings. When the FBI investigation focused on the Trump campaign, Sessions stood down from the inquiry, much to Trump's irritation. That decision to step down dogged him to the end, and he was written out of the series close to the end of Season Four, when Trump forced him to resign. That move put control of the Mueller investigation into the hands of a Trump loyalist. This was where the drama really picked up and all the plot lines came together. A lot of the background characters we saw in Season One came back with a vengeance and the infighting got nasty - and this is when the police started circling. Who was she? A Russian lawyer with a fearsome reputation who fought against US restrictions on Russia. But was she a Kremlin stooge? Despite earlier denials, she admitted in April 2018 to being an "informant" for Russia's prosecutor general. Key plot line Hers was a small but crucial role - she's the one who Manafort, Trump Jr and Trump's son-in-law Jared Kushner met in June 2016, the details of which begin trickling out a year later in a flashback sequence. She said the meeting was to discuss adoptions - but those who helped set it up said she was offering dirt on the Democrats and Hillary Clinton's campaign. While the meeting became a central plot point, whatever happened inside never actually led to any charges. Who were they? Emin Agalarov is Azerbaijan's biggest pop star, of course. Have you not heard Love is a Deadly Game? Emin helped bring Donald Trump's Miss Universe competition to Russia and the two are close enough to send each other birthday messages. His dad, Aras, is a billionaire who mixes in the highest circles of influence in Moscow. Key plot line Again in a flashback scene, we met Emin as he set the wheels in motion on that Trump Jr meeting. An email sent to Trump Jr suggested Emin was offering information on the Democrats (Emin said he wasn't). The email also said Aras Agalarov had apparently met the "crown prosecutor" of Russia - a role that weirdly didn't exist - and got information on Hillary Clinton. Who was he? He became deputy attorney general under Jeff Sessions. In the TV drama of the Russia scandal, this is the sort of role that would go to a solid Broadway actor you recognise but can't put a name to. Key plot line When Sessions stood down from leading the main investigation into the Trump-Russia ties, it fell to Rosenstein to do that job. In a major plot development, he appointed a special investigator - not a popular move with the White House. Read more: Who is Rod Rosenstein? Who was he? Married to Trump's daughter, Ivanka, Kushner was the character who was seen but very rarely heard. Key plot line Amid cries of nepotism, he was given a plum White House job as senior adviser to the president with a wide-ranging portfolio. It was his contacts with the Russians during the election campaign and beyond that led investigators to circle him. In June 2016, Kushner attended THAT meeting with Donald Trump Jr and the Russian lawyer. He said he was so bored he messaged his assistant to call him so he could leave. Kushner was also another character who had repeated contact with Russian ambassador Sergei Kislyak - contact that he initially failed to disclose. Who was he? A British former tabloid journalist, with a penchant for selfies in silly hats, was perhaps an unlikely addition to the cast, but in most good dramas there's always room for the slightly out-of-place eccentric. Key plot line Rob Goldstone found his way into Donald Trump's circle of trust thanks to his connections with Russian pop star Emin Agalarov. Goldstone managed the pop star, and it was he who contacted Donald Trump Jr on behalf of his client to set up that now-infamous meeting at Trump Tower in June 2016. Goldstone sent an email to Trump Jr promising dirt on Hillary Clinton. Who was he? At 6ft 8in, James Comey was a towering figure, the character who gave little away about himself personally but had a huge role in this story. Key plot line He first entered this drama in Season One, when as head of the FBI he reopened the investigation into Hillary Clinton's emails - just weeks before the election. Democrats blamed him for her loss, Republicans hailed him a hero. That, we thought, was the last we'd seen of him. Jump ahead to Season Three, when months into the Trump presidency, Comey was fired by the new president. In true television drama style, he learned of his sacking as he was watching TV news during a trip to LA. Up to then, Comey was heading up an investigation into possible ties between the Trump campaign and Russia. Even by the end of the series, whether this amounted to obstruction of justice by the president remained an unresolved plot point. Comey's testimony to the Senate was one of the most set-pieces in the series up to this point, as - under oath - he told politicians he was asked to pledge loyalty to the president, but refused. Who was he? A former election adviser to Trump, although you'd be forgiven if you didn't remember the face. He was in only a few scenes in Season Two, but he had a massive role to play in Season Three, becoming the first person to plead guilty as part of the investigation. Key plot line In late October 2017, court documents emerged showing Papadopoulos had pleaded guilty to lying to the FBI about the timing of meetings with alleged go-betweens for Russia. After lying to the FBI, he deleted an incriminating Facebook account and destroyed a phone. His guilty plea and co-operation with the investigation had the potential to damage the US leader because it related directly to his campaign - but in the end, it didn't do so. Who was he? The man who held the fate of the Trump presidency in his hands. Key plot line Some characters wielded a lot of power, but didn't have a starring role, such as Robert Mueller, the tall chiselled figure who was appointed as "special counsel" to take over the Russia investigation after the dismissal of James Comey. Mueller came from the same stock as Comey - both were former heads of the FBI. There were no showboating scenes and powerhouses speeches from Mueller in this series - we only ever saw him studiously working in his office. There were reports that the president considered firing Mueller at one point - but Mueller stayed in the background doing his job until the very end of the series. After Season Three ended with the first charges being laid down by Robert Mueller, things really sped up in Season Four. The president's fury with the special counsel investigation increased and he fired his Attorney-General. But the series ended with no charges laid against the president and a sense of victory in the White House. Might we see a spin-off series...? Who was he? OK, he wasn't Putin's chef by this point, but he once was. In Season Four, he was the man accused of spearheading Russia's attempts to interfere in the 2016 election. Key plot line A little out of the blue, Mueller announced charges against Prigozhin and 12 other Russians, accusing them of tampering with the US election by (among other things) organising and promoting political rallies in the US. In one surreal flashback sequence, we even see the Russians trying to buy a cage large enough to hold an actress dressed as Hillary Clinton in a prison costume. Who was he? The man who once said he would take a bullet for Donald Trump - but who instead turned against him. Key plot line Cohen, as Trump's long-time personal lawyer, lingered around the edges of the plot for the first three seasons, but became the big player of the fourth. When Mueller's team began looking into Cohen's finances, they passed on their concerns to investigators in New York. Then the plot took an unexpected new turn: Cohen, a long-time Trump loyalist, flipped and began co-operating with investigators. Not only that, but he ended up giving them a lot of help in exchange for a lighter sentence. Cohen ended up admitting violating campaign finance laws, committing tax evasion and lying to Congress. The last shot of the entire series was a mournful Cohen being locked into his jail cell. Who was he? A long-time Washington political operative who acted as an informal adviser to the Trump campaign. He called himself an agent provocateur, and once defended his actions by saying: "One man's dirty trick is another man's political, civic action." Key plot line Stone was one of those memorable bit-part characters in Seasons One and Two - a colourful character known for his fiery tongue, sharp suits and the Richard Nixon tattoo spread across his back. Towards the end of Season One, he appeared to let the cat out of the bag, hinting on Twitter that there was damaging information coming out on Hillary Clinton. Soon after, that information (that we later learned was found by Russia) was made public. After a bit of a lull in the middle of Season Four, investigators indicted Stone on seven counts of witness tampering, obstruction and false statements, although he wasn't charged with co-ordinating with Russia. All the way through, he denied any wrongdoing. He, like the president, called the investigation a "witch-hunt" and once said the accusations of collusion with Russia were "a steaming plate of bull".